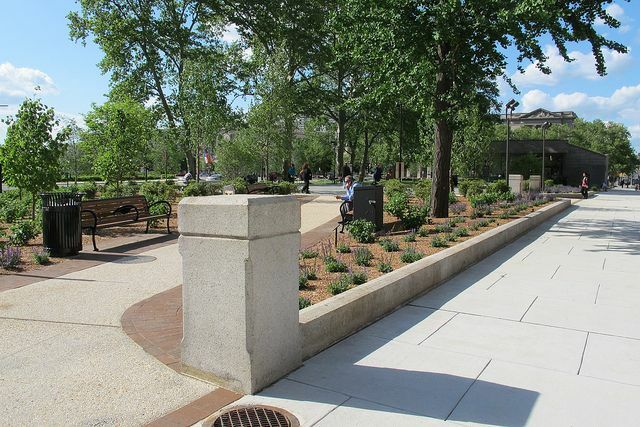 I had the pleasure recently of spending some time in Sister Cities Park. It’s a lovely little alcove tucked to the side of the Benjamin Franklin Parkway near Race Street, a couple of blocks from the main branch of the Free Library. I admit to having been a skeptic about the park. I thought it was a waste of money because its chances of being used were limited by its location in a pedestrian dead zone. I am happy to have been completely wrong. Every time I have been in the park it is being used by delighted visitors. And it still looks beautiful. Photo credit: Plan Philly/Eyes on the Street. Used by permission under a Creative Commons license.